Easter Surprise Scratch Card - Casino Answers! Easter Surprise Scratch is an instant win scratch card developed by Playtech. You can play the Easter Surprise Scratch card at Bovada. The Easter Surprise Scratch casino game is a dime scratch ticket. Bets on the Easter Surprise Scratch lottery ticket are $0.10, $0.20, $0.30, $0.40, $0.50, $0.75, $1, $2, $3, $4, $5, $10, $15, $20, $25, $50, $75 and $100 per game. Easter Surprise Scratch has a fantastic betting range for all types of scratch card players. To play the Easter Surprise scratch-it game, select your bet under “Card Value,” press “Play” and click each of the nine squares to scratch them, plus the prize on top. Alternatively, you can press the “Scratch All” button to scratch all ten areas on the scratch card. If you are able to match three Easter Bunny symbols in a row, column or diagonally, you will win the prize listed above the scratch card. The highest payout in Easter Surprise Scratch is 10,000X your bet. By matching three Easter Bunny symbols, you will win the prize listed above the scratch card. You can win up to $1,000,000 playing the Easter Surprise scratchie at Bovada! The Easter Surprise scratch and win game has a basic autoplay mode. 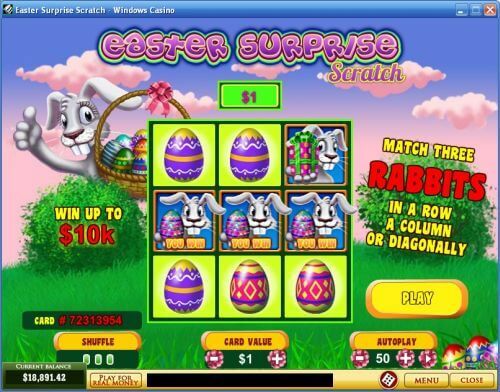 Use the “+” and “-” buttons under “Autoplay” to select from 1 to 99 autoplay games of Easter Surprise Scratch. To start the autoplay mode on Easter Surprise Scratch, simply press the Play button. Press the Stop button to stop the autoplay mode at any time. If you’re in the mood for Easter and you enjoy playing scratch tickets or instant win games online, you will enjoy playing the Easter Surprise Scratch casino game. Easter Surprise Scratch is an easy game to play, very dynamic to play and gives you the chance to win lots of cash. You can play the Easter Surprise Scratch instant lottery game when you sign up and make a deposit today at Bovada! Isn’t Easter Surprise a video slot? It’s both. Easter Surprise is a Playtech video slot as well as a scratch card. You can play both of these games at Bovada. Can players from the USA play the Easter Surprise scratch-it game? No, American players cannot play the Easter Surprise scratchie at this time. For a great selection of scratch cards for USA-based players, please visit Bovada. Do I need to download any casino software to play the Easter Surprise online scratch card game? No, you can play the Easter Surprise Scratch game in your web browser at Bovada. You can play it for free or real money. If you experience any difficulties with the Flash scratch card game, please update your version of Adobe Flash Player.